This quick and easy turkey burger recipe is a healthier alternative to a beef burger. We are using turkey breast meat which is very low in saturated fat. This is one of my favorite burger recipes as it is very juicy and full of flavor. It takes only 25-30 min from start to finish and can be grilled or barbequed, we are using the grill here. The nutritional profile of the recipe can be seen below. It is suitable for a low glycemic index diet, low carb high protein diet, low fat, diabetic and gluten free diet. The recipe contains 4g of net carbs per portion. Garnishing with 2 cups of shredded romaine lettuce will add to the dish 16 calories and 1g of net carbs. Recipe Nutritional Profile: Diabetes Appropriate, Healthy Weight, Healthy Heart, High Potassium, High Protein, Low Calories, Low Carbs, Low Fat, Low GI, Low Sodium, Gluten Free, Good Source of: Vitamin B-6, Vitamin C, Niacin, Phosphorus and Selenium. To serve: romaine lettuce leaves, cut into bite size pieces. In a large bowl combine together the turkey breast mince meat, tomato, spring onion, garlic, parsley, mustard, egg white and seasoning. Mix it well with clean hands and form 4 patties out of the mixture. Preheat the grill. Place the burgers under the grill and cook them 8-10 min on each side until the turkey is completely cooked through. 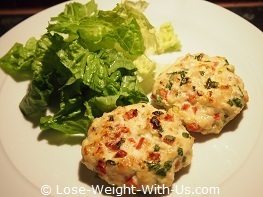 Serve the turkey burgers hot with the romaine lettuce leaves. This recipe can also be used for meatballs or meatloaf.